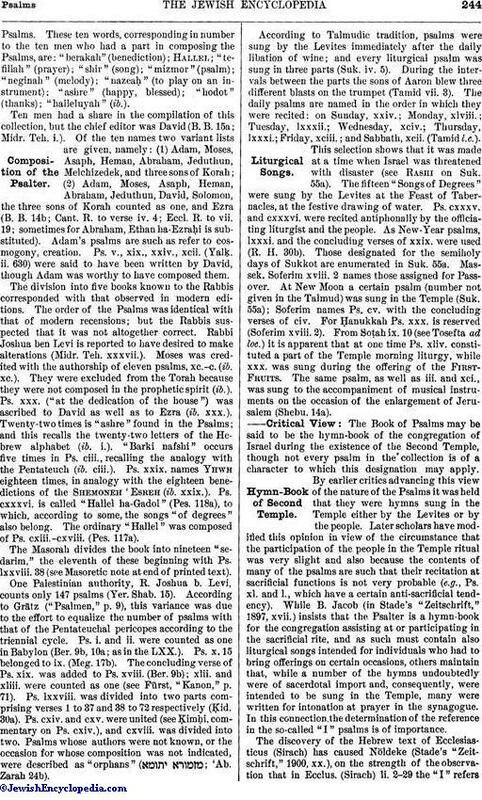 In the printed Hebrew Bible the Book of Psalms is the first of the Ketubim; but it did not always occupy this position, having formerly been preceded by Ruth. (B. B. 14b; Tos. to. B. B. l.c.). 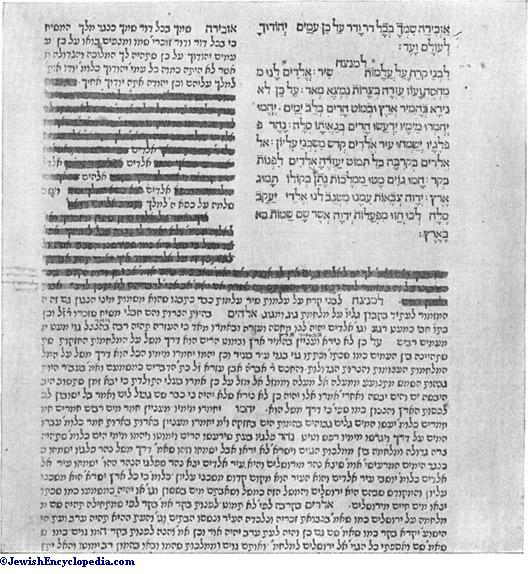 Jerome, however ("Prologus Galeatus"), has another order, in which Job is first and the Psalms second, while Sephardic manuscripts assign to Chronicles the first and to the Psalms the second place (comp. 'Ab. Zarah 19a). The Book of Psalms is one of the three poetic books denoted as (EMaT = Job [Iyyob], Proverbs [Mishle], and Psalms [Tehillim]) and having an accentuation (see Accents in Hebrew) of their own. The Sefer Tehillim consists of 150 psalms divided into five books, as follows: book i. = Ps. i.-xli. ii. = Ps. xlii.-lxxii. ; iii. = Ps. lxxiii.-lxxxix. ; iv. = Ps. xc.-cvi. ; v. = Ps. cvii.-cl., the divisions between these books being indicated by doxologies (Ps. xli. 14 [A. V. 13]; lxxii. 19 [18-19]; lxxxix. 53 ; cvi. 48). The conclusion of book ii. is still further marked by the gloss = "The prayers of David, the son of Jesse, are ended." Of the 150 psalms 100 are ascribed, in their superscriptions, to various authors by name: one, Ps. xc., to Moses; seventy-three to David; two, lxxii. and cxxvii., to Solomon; twelve, 1. and lxxiii. to lxxxiii., to Asaph; one, lxxxviii., to Heman; one, lxxxix., to Ethan; ten to the sons of Korah (eleven if lxxxviii., attributed also to Heman, is assigned to them). In the Septuagint ten more psalms are credited to David. Sixteen psalms have other (mostly musical) headings. According to their contents, the Psalms may be grouped as follows: (1) hymns of praise, (2) elegies, and (3) didactic psalms. The richest in content and the most precious of the three large Ketubim (Ber. 57a), the Sefer Tehillim is regarded as a second Pentateuch, whose virtual composer was David, often likened to Moses (Midr. Teh. ch. i.). "Moses gave [Israel] the five books of the Torah, and to correspond with them [ ] David gave them the Sefer Tehillim, in which also there are five books" (ib.). Its sacred character as distinct from such books as the "Sifre Homerns" (works of Hermes, not Homer) is explicitly emphasized (Midr. Teh. l.c. ; Yalḳ. ii. 613, 678). The Psalms are essentially "songs and laudations" ( ). According to Rab, the proper designation for the book would be "Halleluyah" (Midr. Teh. l.c. ), because that term comprehends both the Divine Name and its glorification, and for this reason is held to be the best of the ten words for praise occurring in the Psalms. 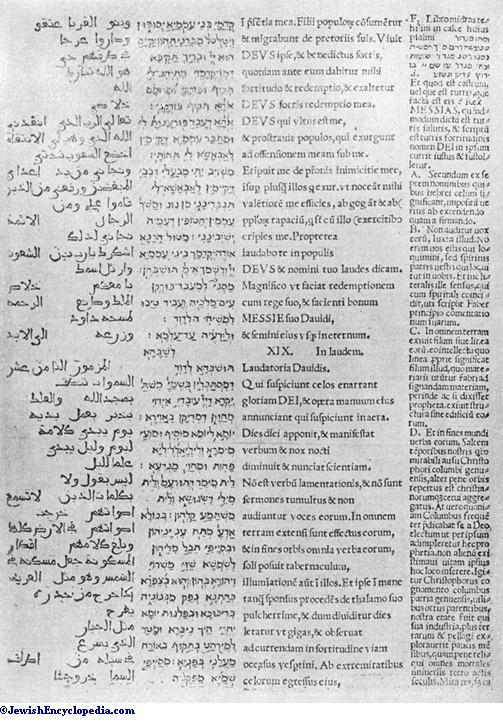 These ten words, corresponding in number to the ten men who had a part in composing the Psalms, are: "berakah" (benediction); Hallel; "tefillah" (prayer); "shir" (song); "mizmor" (psalm); "neginah" (melody); "nazeaḥ" (to play on an instrument); "ashre" (happy, blessed); "hodot" (thanks); "halleluyah" (ib.). One Palestinian authority, R. Joshua b. Levi, counts only 147 psalms (Yer. Shah. 15). 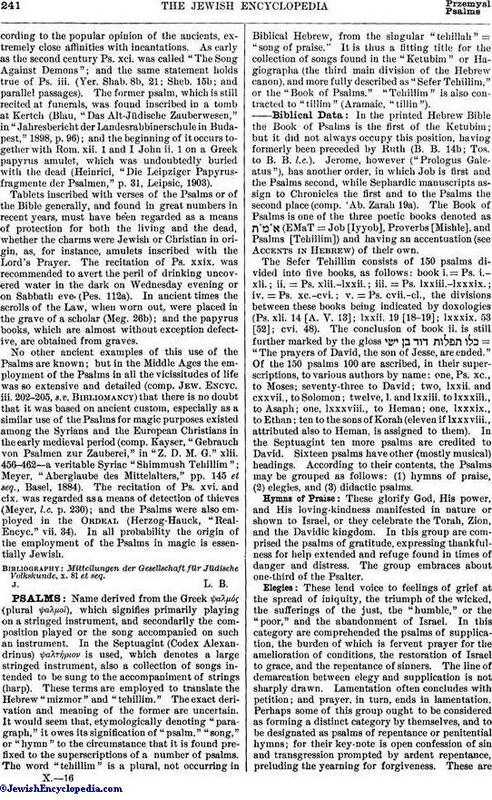 According to Grätz ("Psalem," p. 9), this variance was due to the effort to equalize the number of psalms with that of the Pentateuchal pericopes according to the triennial cycle. Ps. i. and ii. were counted as one in Babylon (Ber. 9b, 10a; as in the LXX.). Ps. x. 15 belonged to ix. (Meg. 17b). The concluding verse of Ps. xix. was added to Ps. xviii. (Ber. 9b); xlii. and xliii. were counted as one (see Fürst, "Kanon," p. 71). Ps. lxxviii. was divided into two parts comprising verses 1 to 37 and 38 to 72 respectively (Ḳid. 30a). Ps. cxiv. and cxv. were united (see Ḳimḥi, commentary on Ps. cxiv. ), and cxviii, was divided into two. Psalms whose authors were not known, or the occasion for whose composition was not indicated, were described as "orphans" ( ; 'Ab. Zarah 24b). The existing Psalter is a compilation of various collections made at various times. The division into several parts was not in every case altogether due to a desire to imitate the structure of the Pentateuch. Books i. (Ps. i.-lxi. ), ii. (Ps. lxii.-lxxii. ), and iii. (Ps. lxxiii.-lxxxix.) are marked as separate collections by doxologies, a fact which points to their separate compilation. The doxology which now divides books iv. and v. after Ps. cvi. has the appearance of being the beginning of another psalm (comp. I. Chron. xvi., where it occurs at the close of the interpolation verses 8 to 36). It is impossible to determine the date at which these older collections may have been put together. 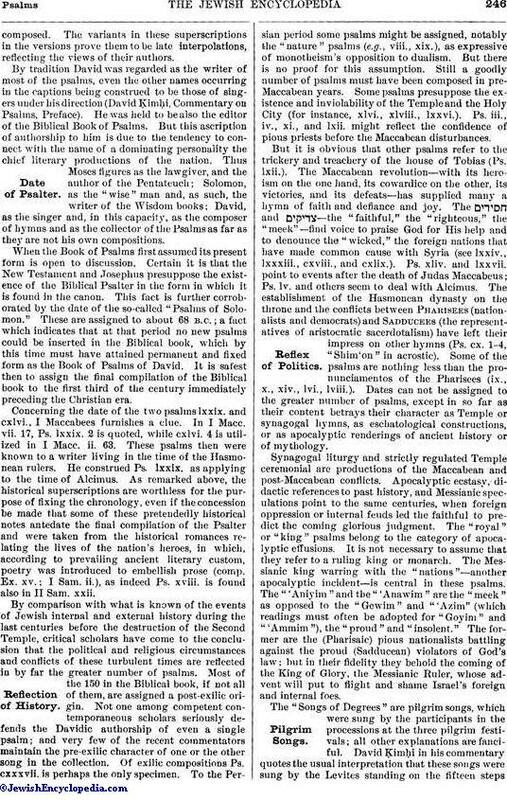 Book i., containing "David" psalms (originally without Ps. i. and ii. ), may have been the first to be compiled. In books ii. and iii. (Ps. lxii-lxxxix.) several older and smaller compilations seem to be represented, and that, too, in some disorder. The (a) "David" hymns (ὐμνοι = ; ib. li-lxxii.) are clearly distinct from the (b) songs of the sons of Korah (xlii.-xlix. ), (c) "Asaph" songs (l., lxxiii.-lxxxiii. 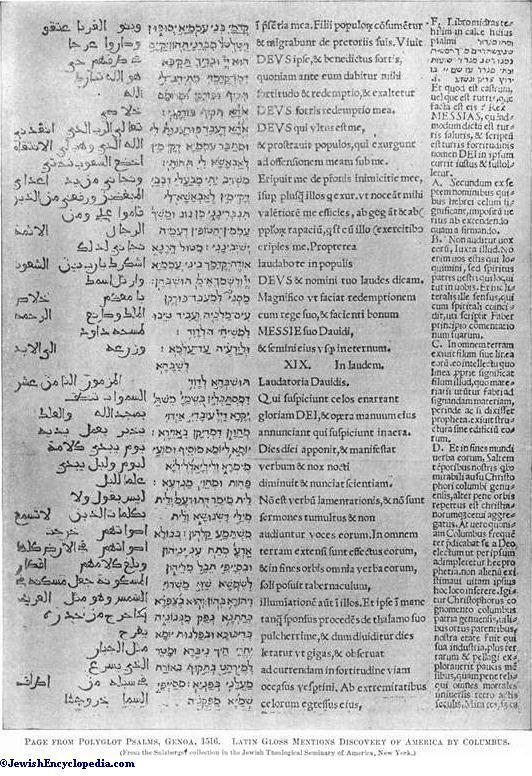 ), and (d) later supplements of promiscuous psalms (lxxxiv.-lxxxix.). It is noteworthy that in the "David" hymns duplicates of psalms are found, incorporated also in book i. (Ps. liii. = xiv. ; lxx. = xl. 14-18; lxxi. 1-3 = xxxi. 2-4), while lvii. 8 et seq. is duplicated in book v. (cviii. 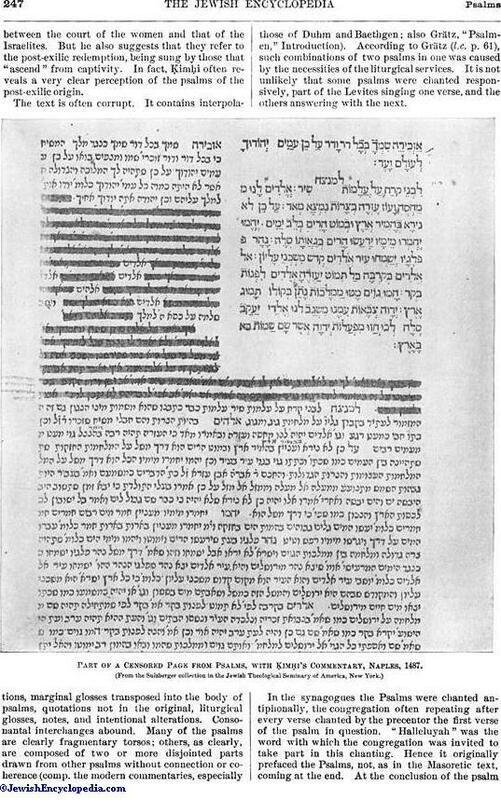 2-6). Another peculiarity of this book is the use of "Elohim" for "Yhwh," except in the supplement (lxxxiv.-lxxxix.). As to who were the compilers of these distinct collections it has been suggested that an inference might be drawn in the case of the psalms marked "to the sons of Korah" or "to Asaph, Heman, Ethan, Jeduthun," respectively. But the ל prefixed to the superscription in these cases is plainly not a "lamed auctoris," the names being those of the leaders of the choir-gilds (established, according to Chronicles, by David). The headings in which ל occurs merely indicate that the hymns were usually sung by the choristers known as "sons of Korah," etc., or that the psalm constituting a part of the repertoire of the singers so named was to be sung according to a fixed melody introduced by them. These choir-masters, then, had collected their favorite hymns, and, in consequence, these continued to be named after their collector and to be sung according to the melody introduced by the gild. It has also been urged as explaining the terms ("unto David," "unto Moses") that a certain melody was known by that term, or a collection happened to be labeled in that way. It is, however, manifest that in some instances the superscription admits of no other construction than that it is meant to name the author of the psalm (Moses, for instance, in Ps. xc. ), though such expressions as "David song," "Zion song" = "Yhwh song" may very well have come into vogue as designations of sacred as distinguished from profane poems and strains. Still, one must not forget that these superscriptions are late additions. The historical value of the note (= "unto David") is not greater than that of others pretending to give the occasion when and the circumstances under which the particular psalm wascomposed. The variants in these superscriptions in the versions prove them to be late interpolations, reflecting the views of their authors. But it is obvious that other psalms refer to the trickery and treachery of the house of Tobias (Ps. lxii.). The Maccabean revolution—with its heroism on the one hand, its cowardice on the other, its victories, and its defeats—has supplied many a hymn of faith and defiance and joy. The and —the "faithful," the "righteous," the "meek"—find voice to praise God for His help and to denounce the "wicked," the foreign nations that have made common cause with Syria (see lxxiv., lxxxiii., cxviii., and cxlix.). Ps. xliv. and lxxvii., point to events after the death of Judas Maccabeus; Ps. lv. and others seem to deal with Alcimus. The establishment of the Hasmonean dynasty on the throne and the conflicts between Pharisees (nationalists and democrats) and Sadducees (the representatives of aristocratic sacerdotalism) have left their impress on other hymns (Ps. ex. 1-4, "Shim'on" in acrostic). Some of the psalms are nothing less than the pronunciamentos of the Pharisees (ix., x., xiv., lvi., lviii.). Dates can not be assigned to the greater number of psalms, except in so far as their content betrays their character as Temple or synagogal hymns, as eschatological constructions, or as apocalyptic renderings of ancient history or of mythology. In the synagogues the Psalms were chanted antiphonally, the congregation often repeating after every verse chanted by the precentor the first verse of the psalm in question. "Halleluyah" was the word with which the congregation was invited to take part in this chanting. Hence it originally prefaced the Psalms, not, as in the Masoretic text, coming at the end. 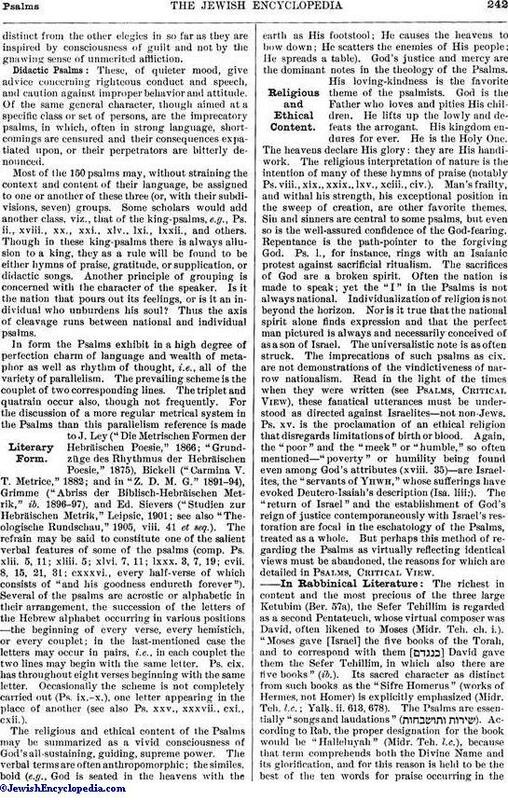 At the conclusion of the psalmthe "maḳre" or precentor added a doxology ending with ("and say ye Amen"), whereupon the congregation replied "Amen, Amen" ("Monatsschrift," 1872, p. 481). 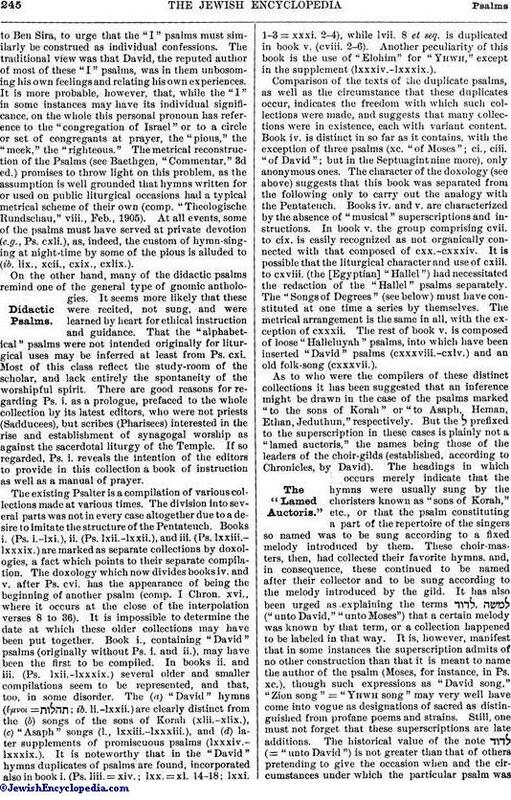 The synagogal psalms, according to this, then, are cv., cvi., cvii., cxi., cxii., cxiii., cxiv., cxvi., and cxvii. (the shortest of all psalms), cxviii., cxxxv., cxxxvi., cxlvi.-cl. Fifty-seven psalms are designated as ; this is a word denoting "paragraph," hence a new beginning. Thirty psalms are designated as (= "song"), probably indicating that the psalm was actually sung in the Temple. Thirteen psalms are labeled , the meaning of which word is doubtful (see Hebrew dictionaries and the commentaries). Six psalms are superscribed —another puzzle—three times with the addition , once (lx. ), and in lvi. with . Five psalms are called = "prayer" (xvii., xl., lxxxvi., cii., cxlii.). Two psalms are marked = "to remember" (xxxviii., lxx. ), the meaning of which is not known. Ps. 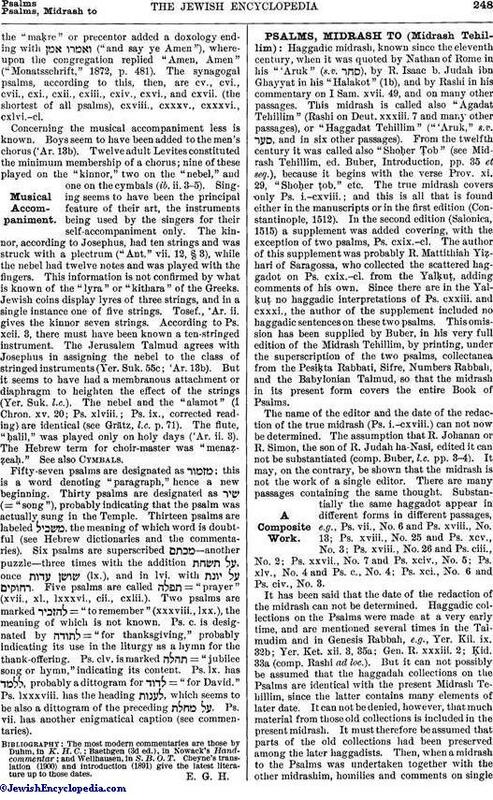 c. is designated by = "for thanksgiving," probably indicating its use in the liturgy as a hymn for the thank-offering. Ps. clv. is marked = "jubilee song or hymn," indicating its content. Ps. lx. has , probably a dittogram for = "for David." Ps. lxxxviii. has the heading , which seems to be also a dittogram of the preceding . Ps. vii. has another enigmatical caption (see commentaries).